NEW YORK�(CNNMoney) -- Stock futures were mixed Thursday, suggesting a weak opening, after reports showed an increase in weekly unemployment filings and tepid economic growth in the first quarter. Dow Jones industrial average (INDU), S&P 500 (SPX) and Nasdaq (COMP) futures were slightly lower ahead of the opening bell. Futures measure current index values against perceived future performance. Stocks have been struggling this month, as optimism over upbeat corporate earnings has been tempered by signs the economy could be in for a slowdown this summer. May has been a volatile month for stocks overall, with the Dow and S&P 500 both down about 3.2% since the beginning of the month. Analysts at Standard & Poors are predicting the stock market could be in for a 10% correction over the next month. "The global equity markets continue to wrestle with the paradox of rising earnings estimates and declining global economic growth indicators," said Sam Stovall, chief investment strategist with Standard & Poor's Equity Research, in a note to investors Wednesday. Stocks posted modest gains Wednesday, but are in negative territory for the week overall. Economy: The number of Americans filing first-time claims for unemployment benefits rose 10,000 to 424,000 in the most recent week, the Labor Department said. Economists were expecting 400,000 initial claims, according to consensus estimates from Briefing.com. Separately, the government's revised reading on first-quarter U.S. gross domestic product was unchanged from the initial report. The Commerce Department said GDP, the broadest measure of economic activity, grew 1.8% over the same quarter a year ago. Economists had expected the figure to be revised up to 2%. Companies: Shares of Tiffany & Co. (TIF) rose more than 4% in pre-market trading after the luxury jeweler reported a 12% jump in sales. The company also hiked its quarterly dividend payment to 29 cents per share from 25 cents. NetApp (NTAP) shares rose 4% before the open after the data storage company reported strong quarterly results late Wednesday and issued an upbeat outlook for the current quarter. Discount retailer Big Lots (BIG, Fortune 500) said earnings rose in the most recent quarter, but issued a dour sales outlook for the current quarter, saying it expects revenue to be flat or down 3%. Sony (SNE) reported $3.1 billion loss for its fiscal year, which ended in March. The company said the loss was due to deferred tax assets, and that it expects to report a profit in the current fiscal year. 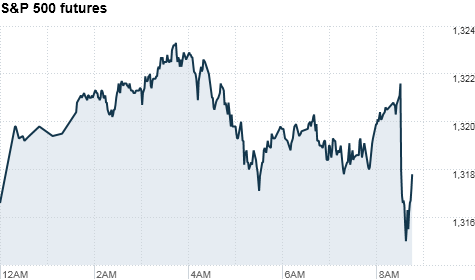 World markets: European stocks were steady in morning trading. Britain's FTSE 100 rose 0.4%, while the DAX in Germany slid 0.6% and France's CAC 40 was down 0.2%. Asian markets ended the session mixed. The Shanghai Composite edged lower 0.2%, while the Hang Seng in Hong Kong added 0.7% and Japan's Nikkei rallied 1.5%. Currencies and commodities: The dollar fell against the euro, the Japanese yen and the British pound. Oil for July delivery fell 34 cents to $100.98 a barrel. Gold futures for June delivery fell $1.80 to $1,524.90 an ounce. Silver priced edged 2% lower. Bonds: The price on the benchmark 10-year U.S. Treasury rose, pushing the yield down to 3.13% from 3.14% late Wednesday.